Jouer or faire? In French, like English, we can both play and do sports/games/hobbies, but you need to know which verb sounds correct for each activity. Here are the rules to help you get it right! Je fais du sport tous les jours. I do sport every day. Tu fais de la natation. You swim (regularly / in a club). 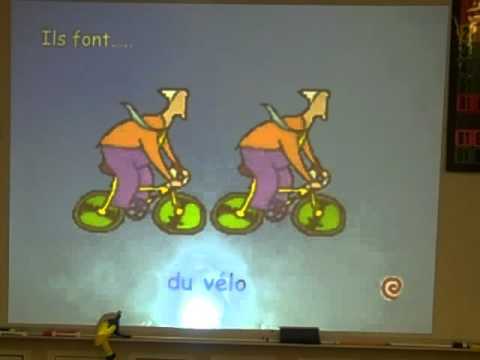 You can use faire de followed by la or l' in front of a vowel or mute h, but remember that le and les will contract with de and become du and des. For some activities, such as skiing or horse riding, you cannot use jouer, just like you wouldn't say I play ski or I play horse riding in English. When using "faire de la danse" or "faire de la natation" (FOR EXAMPLE) rather than simply "danser" or "nager", you refer more to an organised, repeated activity - I take dance lessons / I go swimming [as a regular activity, e.g. attending class or lessons] - than just a 'one-off' activity you're in the middle of doing such as I'm dancing / I'm swimming. Je fais du ski quand je suis dans les Alpes. I ski when I'm in the Alps. Je skie avec ma famille. I'm skiing with my family. -> Note that in that context, the difference is not very noticeable. Remember, English has two present tenses: I dance (simple), and I am dancing (continuous) which lets us make the distinction between something you do regularly versus something you're in the middle of doing. French has no present continuous tense, so we use faire de to distinguish the regular activity that you do, from the one-off activity you are doing. You can use jouer à followed by la or l' in front of a vowel or mute h, but remember that le and les will contract with à and become au and aux. With music instruments, you will use de instead of à (See Jouer de = to play an instrument). She goes horse riding (regularly / in a club). When I say Le mardi et le jeudi , [je nage] or [ je faire de la natation] à cinq heur. Which one would be correct? It is a regular activity bit Je faire de la natation seems wrong in this context. You would use ‘faire de la natation’ as it represents the activity ‘to go swimming’ rather than the physicality of doing swimming movements. Tricky and very subtle I know but hope this helps! Bonjour, I put that "she's dancing" and can't work out why it was marked wrong, the answer is "she takes dance lessons" please could you explain? "Remember, English has two present tenses: I dance (simple), and I am dancing (continuous) which lets us make the distinction between something you do regularly versus something you're in the middle of doing. French has no present continuous tense, so we use faire de to distinguish the regular activity that you do, from the one-off activity you are doing. " How to describe one-off dancing / swimming? How would one then say: "I am dancing / I dance" without implying one is taking dance lessons? Same for swimming. Ma voiture fait un drôle de bruit....Hope this helps! The lesson implies that the two are interchangeable. Ironically, while the only correct response in the quiz for "golf" is jouer à, the link to a lesson that Laura wrote states that both faire de and jouir à can be used. https://www.thoughtco.com/french-vocabulary-learn-to-talk-sports-4079654 Suggest that these distinctions be made clearer in the lesson. Thanks. Je fais des leçons du français. I take french lessons ? No, that doesn't work in French. You could say, Je prends un cours de français. Just wondering if it might be possible to add a note after the end of the examples for »jouer à/au » and sport saying NB when you play an instrument however you say « jouer à la/au » just to remind people that jouer is used in this way also??? For musical instruments we use, 'jouer de'. thanks Cécile it does. Just think it would be useful to mention this in the faire/jouer section on playing sports...as a note...”but when used with instruments it is ‘Jouer de/etc”. I see somebody else agrees with me. What is the accent of the woman speaking in the embedded video? Is she French-Canadian?